By Thomas S ellers Jr. The Town of Brighton celebrated it 100th birthday with the Brighton Centennial held at the Old Brighton High School this past weekend. Hundreds showed up to the new Brighton High School to be picked up by shuttle buses provided by area churches to be driven to the Brighton Centennial site. There were activities for all ages ranging from a history lesson to a performance by the Brighton Showstars. One area was designated for children’s play area featuring space bounces and a dunk tank that the Mayor Jeff A. Scott even took a turn on. Speaking of taking turns, many children climbed the wall like 4-year-old Jaxon Jones. Just a few feet away arts and crafts were on display and on sale. While some event goers shopped, the aroma of burgers, barbecue and funnel cakes flowed through the sunny pleasant conditions. With sights and smells, the boom came courtesy of the Memphis Bluff City Grays 154 trio of Mike Daugherty, Bill Dunaway and Mark Buchanan. The men shot off historic Civil War style rifles every hour on the hour. Not to be out done, members of the Simonton-Wilcox Camp No. 257 blasted off antique cannons. One member’s grandchildren, Kyle, 8, Maddie, 5, and Jessie, 3, wore authentic Civil War era clothing. 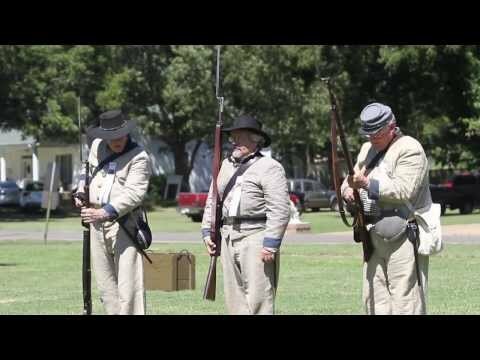 Camp 257 Commander Russell Bailey took the opportunity to teach visitors about the history of Brighton and the Sons of Confederate Veterans which was organized in 1891 in Tennessee. The organization came to Covington in 1901. And the current Simonton-Wilcox group was established in 1975 as an historical memorial fraternal society preserving history, war records, relics and burial sites of Conferdated soldiers of the Civil War. For more information on the 501-c3 non-profit group, call 476-3744 or e-mail rbbailey@comcast.net. The beauty of Brighton was on full display from landmarks to queens like Brighton High’s Desiree Dyson, Miss Junior Teen Brighton Centennial.